I do get some weird and wonderful jobs offered to me but I think yesterday’s duty with Southern Vectis 573 was definitely one of the latter. 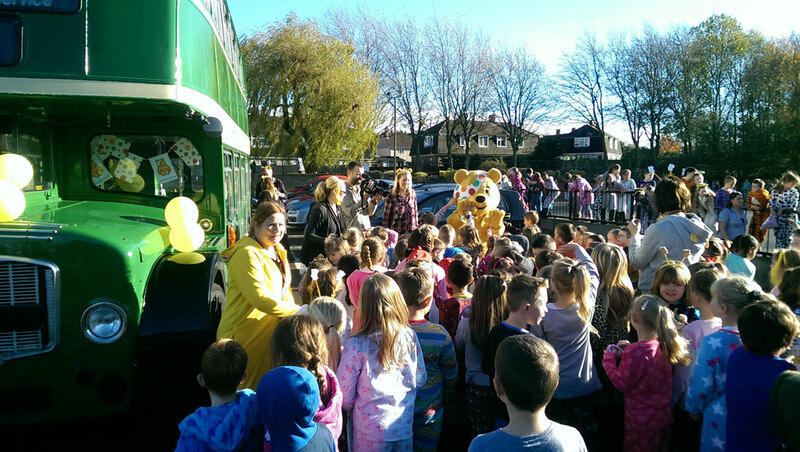 BBC Radio Bristol required a vintage bus in which to convey Children in Need’s Pudsey Bear around the region on November 14th to make a surprise visit to some primary school children. Crosville Motor Services apparently had the ideal bus and they kindly gave me the chance to do the honours at the wheel. But what they neglected to tell me, when asking if I was free on that date, was that it required an early start. A VERY early start. I kid you not dear reader, I had to set my alarm for 2.30am in order to meet the BBC Radio Bristol crew in Keynsham at 6.30am. It took me 1.5 hours to drive to the bus depot from deepest Devon and then, having checked the bus, had a further hour or so on the road at 30mph max before I reached the rendezvous point. And so it was that I found myself all alone in a car park in Keynsham, which is between Bristol and Bath. It was raining and still very dark. Not long afterwards the crew arrived in a support van covered in BBC Local Radio branding. Led by their charming producer Lucy they set to work decorating the bus, applying Children in Need stickers to the windows and hanging banners and balloons everywhere. Before we left for our first pickup point we had to wait until just after 7am when they were due to do a live piece on the radio to introduce the listeners to the day-long journey. This included me starting up the engine, at which point I became rather nervous. My last outing with this bus was rather spoiled by a failing battery but the bus was now fitted with two brand new ones. Thankfully she started, if a little reluctantly. Oh dear – an omen, perhaps? “I’ll meet you back at base,” called one of the radio chaps as he hopped into the van. Our first stop was to be Broadcasting House in Whiteladies Road. I expect he thought he’d beat us by several minutes as our bus, built in 1962, is rather slow and cumbersome. But, despite the increasing commuter traffic, we got there first because I was able to use the bus lanes!